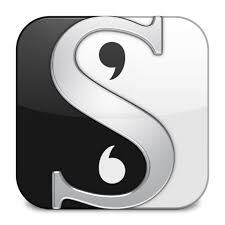 Before I get into the unexpected happenings of NaNoWriMo, I'd like to take a moment to talk about Scrivener. I purchased Scrivener two summers ago, after reading Stephen King's On Writing. I used it a fair amount at the end of that summer and for the rest of 2015, but had really not done very much writing during 2016. This was not the tool's fault, unless we're referring to the tool between the keyboard and chair. Scrivener is a very powerful tool for all kinds of writing. I happen to use it to write short stories and blog entries, but it supports authorship of screenplays, scholarly or news articles, and poetry among other things. It's a mature product, and has a LOT of how-to articles and videos to help you get up the learning curve. It's a little pricey, but not selling for an exorbitant amount, costing as much as a newly released video game and less than a yearly license for almost all of the other software tools I use professionally. So, with Scrivener opened to a newly created novel project, I started typing. My normal writing speed is somewhere between 700 and 900 words per hour without stopping for too much editing or backtracking. With NaNoWriMo, you're supposed to write an average of 1,667 words daily to get to the 50,000 word mark by the end of November. At my hourly rate, I was going to have to write for at least a couple of hours a day. I was getting up an hour earlier than usual, so one hour was available, but where would the other hour come from? As I typed that first morning, words appeared on the page, and kept appearing regardless of my effort to stop. I wrote for at least an hour and a half, and found that I was genuinely enjoying it. I went to work, but was distracted at times by thoughts about what was going on with the story, as if the characters' lives were progressing while I wasn't looking. I wound up jotting down random thoughts throughout the day, and then writing more in the evening instead of messing around on the Internet or doing whatever I do normally. During the first two days, I wrote 5,218 words. I wasn't diligent the first two days about updating my word count at the end of each day, but the average for those first two days was 2,609 words per day. I was ahead of schedule already, and quite surprised by that fact. I thought for sure I'd be lagging behind early on. This year really did feel different than my two previous attempts on all levels. There's a maxim in writing: "Show, don't tell." For your edification, here's the breakdown of my progress per day, in tabular format. By the end of the day on the Wednesday before Thanksgiving, I had made it to the victory requirement, and still had a scene left to write. I had done it -- I had written a The-Great-Gatsby-sized novel in just 23 days. As an aside: Sunday 11/13 and Monday 11/14 were the first two days that Tanya was in Australia. I found myself both inspired and trying not to think about the fact that she was on the other side of the planet quite a bit those days. If I wrote an average of 800 words per hour, then that means that on a typical day for the first three or so weeks of November, I wrote for 2.5 hours. Here's the key bit though: I didn't feel like it was that long. I didn't find myself dreading the time required to get the word count in. I was energized pretty much the entire time. In other words, this didn't feel like work, at least not for those three weeks. I haven't mentioned the final week on purpose, because I took my foot off the gas pedal, let my mind wander a bit, and messed around with a couple of alternate final scenes. I did just enough work on them to realize that I really didn't like either of them. I wound up with almost 56,000 words, but the last 5,000 need to be completely flushed down the toilet in favor of something that actually pleases me. The other thing that I've found myself doing this past week is studying the craft of writing a little more. Brandon Sanderson (one of my favorite authors) teaches a class at BYU on creative writing. This past spring, they recorded the lectures and published them on youtube. If you're interested in what he he has to say, you should definitely check them out. I'm only through the third lesson, but very much like what I've heard so far. Where does that leave me? Am I going to become a professional writer? Almost certainly not. However, I have learned something about myself, and that is that I genuinely like making up silly stories. I fully intend to go back and revise this one in January (as NaNoWriMo has suggested), and even if no one else reads it, it will have been worth it. My imagination produced something that (I think) I would like to read. This is a hobby worth having.